With many exceptional landmarks, museums, and galleries, Vienna is a multi-layered destination. A city located on banks of the Danube River and the Danube Canal, the city has a beautiful shore. Vienna has a lot of pride on. But, getting between points of interest on one s own arrangement exerts a lot of money, energy and time. Thankfully, many hop-on-hop-off buses(Red Bus Vienna Hop on Hop off vs Yellow Bus Sightseeing) and cruisers cover the city efficiently. You can jump off and on the vehicle by most prominent attractions and discover the Austrian capital how suits you best. Finally, hear the story about the city you are discovering and its attractions while you are on board. Each bus on 6 available lines features audio commentary in 16 languages offering an insightful overview of Vienna and its attractions. Where to Buy Vienna Hop-on Hop-off Bus + Boat? We are comparing the Hop On Hop Off Vienna City Sightseeing tour Prices from leading online Tours and Ticket suppliers, try to find you cheap tickets prices on the market. Where to Buy Sightseeing Bus Vienna? Where to Buy Big Bus Tour Vienna? The Vienna Big Bus Hop-On Hop-Off Tour is a convenient sightseeing service of the Austrian capital. With sightseeing by bus and complimentary audio commentary, you will discover this amazing city without effort. Vienna prides on many incredible landmarks, parks and other points of interest. Hence, by joining this professional guided tour, you won't miss anything you shouldn't while enjoying your holiday here. Furthermore, Big Bus Tour Vienna provides some other benefits for their customers, which include additional sightseeing tours by boat and on foot. Acquainting yourself with landmarks, squares, parks, shopping and other areas of the city. 2 bus routes covering all important points of interest throughout Vienna. Around 20 stops for you to take off the bus and rejoin the ride at later. Additional 90-minute walking tour with any type of ticket. Depending on the chosen ticket, a complimentary Night Bus Tour and a boat cruise. Pre-recorded narrative on board every bus in the world's 12 major languages. Free Wi-Fi for you to make use of during the bus tour. Most vehicles are suitable for people with special needs. Bus tours of this provider come with the Vienna City Card. A choice of 1-, 2- and 3-day tickets. Sightseeing including the Opera House, Rathaus, Burgtheater, Stadtpark and other splendid attractions of Vienna. We are comparing the Best Big Bus Tour Vienna Prices from leading online Tours and Ticket suppliers, try to find you cheap tickets prices on the market. Frequency: between 20 minutes and half an hour. Bus stops: State Opera, House of Music, Marianhilfer Strasse, Museums/Hofburg, Rathaus, Votivkirche, Karmeliter Market, Augarten, Prater, Danube Canal and Stadtpark. Bus stops: Museums/Hofburg, House of Music, Haus des Meeres, Marianhilfer Strasse, Schonbrunn, Main Train Station, Arsenal and Belvedere. TripAdvisor: The former users of the Big Bus Tours in Vienna that commented their experience on TripAdvisor fully recommend this bus service. Of over 1000 reviewers, astonishing 50% assessed their experience as 'perfect.” Around 30% of users rate the experience as 'very good.” The number of tourists that are more or less displeased with the provided service is around 10%. Viator: Some 100 reviewers of the Big Bus Tour Vienna on Viator rate their overall experience with the almost unbeatable 4.5 rate. Get Your Guide: People that booked the Sightseeing Tour of Vienna by Big Bus on this website gave the provider an overall rating of 4.4. With the overall rating of former users and a range of accompanying services, everyone should consider booking the Big Bus Vienna Tour. The company's buses cover all significant points of interest in the city and add complimentary tours for an in-depth experience. These are the 90-minute walking tour, tour of the city by bus during the night and a cruise. The lesser number of bus lines and audio commentary languages are certain points we could consider the Sightseeing Tour of Vienna by Big Bus inferior to other providers. Also, this bus service doesn't have discounts at restaurants and stores offered by other two providers. But unlike them, Big Bus offers tickets with the validity period of 3 days. Is the Big Bus Vienna Sightseeing Tour right for me? The Big Bus Tour Vienna is ideal for travelers that prioritize a quick discovery of the Austrian capital over anything else. Booking of upgraded tickets entitles you to experience the city on the night bus tour and the boat cruise. So, if you wish to get yourself acquainted with Vienna from multiple perspectives, the Vienna Sightseeing Big Bus Tour is the right choice for you. The capital of Austria features beautiful landmarks, great museums, gorgeous parks and the attractive riverside. And the Vienna Bus + Boat Sightseeing Service offers you a chance to get to know everything. Bus routes dispose of conveniently deployed stops for you to hop-on and hop-off at to maximize the benefits of your sightseeing. The boat cruise takes you to a circular trip along the waterways of Vienna. In addition, you are free to join a guided walking tour of the historic center where buses can't go. Touring of Viennese attractions and places of interest by bus. Enjoying the riverside of the Austrian capital on board a boat. Listening to the audio commentary in any of 16 available languages you choose. 4 bus lines covering top attractions of the city. A circular cruise by the boat. A complimentary guided walking tour of the downtown in German and English. Over 40 bus stops throughout the city near principal attractions. Discounts at certain restaurants and shops. Audio guides at specified attractions for a discounted price. The Vienna Pass has the services of this provider included in the price. See the Schonbrunn, Belvedere, State Opera, Hofburg, Giant Ferris Wheel and Stadtpark among many other points of interest. Free use of Wi-Fi on board the bus. We are comparing the Best Hop On Hop Off Vienna City Sightseeing tour Prices from leading online Tours and Ticket suppliers, try to find you cheap tickets prices on the market. Frequency: 5 minutes in high and 30 minutes in low seasons. Bus stops: State Opera, Kunsthistoriches Museum, Marianhilfer Strasse, Burgtheater/City Hall, University, Sigmund Freud Museum, Porcelain Manufactory, Museum of Crime, Schwedenbrucke, Morzinplatz, Schwedenplatz, MAK/Museum of Applied Arts, Hilton Hotel/Stadtpark and Kursalon. Frequency: between 20 minutes and 40 minutes. Bus stops: Museum of Applied Arts, Museum Hundertwasser, Giant Ferris Wheel, Imperial Bridge pier 3, Imperial Bridge pier 8, Danube Tower, Old Danube, UNO City and Train Station. Frequency: depending on the season, between 15 minutes and an hour. Stops: State Opera, Kunsthistoriches Museum, Nasch market, Schonbrunn, Main Station, Museum of Military History, Museum of Contemporary Art, Belvedere Palace and Lower Belvedere. Frequency: up to 1:45 hours. Stops: National Theatre/City Hall, University, Sigmund Freud Museum, Strudelhofstiege, Grinzing/Sandgasse, Grinzing/Cobenzlgasse, Panoramic View, Wine Village, Sparkling Wine Cellars, Summer Stage, Votivkirche and MUSA-Museum. TripAdvisor: Assessed by the reviewers on TripAdvisor, Vienna Hop-On Hop-Off Bus + Boat deserves the average rate of 3. Of around 830 past users, around 20% of them are very satisfied with the service while around 30% are mostly satisfied. The number or displeased reviewers with the provider's performance is significantly lower. Hop on, Hop off is very good. Hop ON/OFF tours are great. Many routes to choose from. Grey one on weekend is NOT for a quick visit, unless you want to see the countryside. No time to visit the roman ruins or the palace. Need a whole day to coordinate the buses, then you could do it. Green route up to the top is fantastic. On another note, the day trip to Prague is well organized, a very long day of course. A word of caution, the tour in Prague old town is VERY fast and if you have any qualms about your walking ability, do not do this one. Prague needs way more than a few hours. The Melk Abbey tour and Danube cruise is another great tour from Vienna Sightseeing. Terrific company to get tours from! Get Your Guide: Tourists that booked the Vienna Bus and Boat Sightseeing Tours through Get Your Guide rated the provider's performance with the high 4.1 rate. 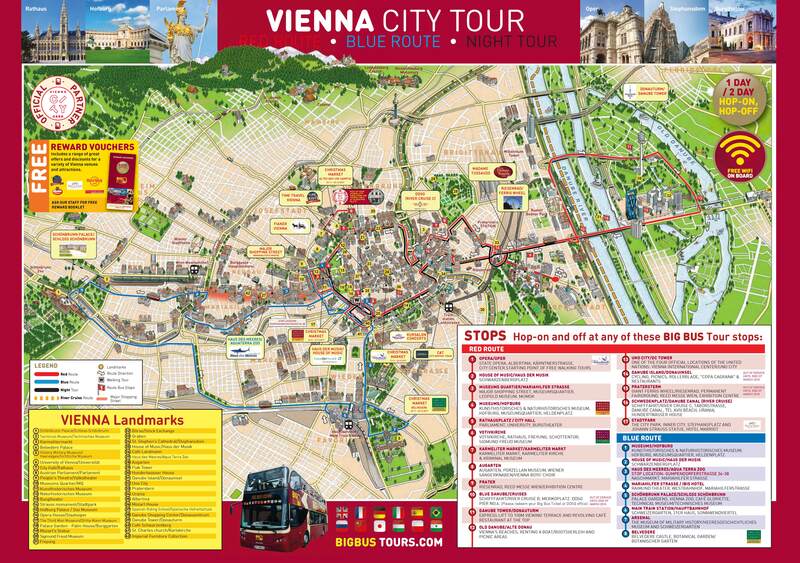 The Vienna Bus & Boat Hop-On Hop-Off Tours offer a comprehensive overview of the city by bus and boat. Besides attractions in the city, you can tour outlying areas by Green bus line. The cruise along the Danube Canal reveals the attractive riverside of Vienna and some surprising points of interest. With audio guides in 16 languages, you are sure to listen to the narrative in a language you know well. Also, 4 bus routes let you narrow down your priorities without the need to travel in wide circles. As a bonus, you benefit of various discounts (at attractions, shops and restaurants) and free Wi-Fi while getting around on the bus. Is Vienna Bus & Boat sightseeing Tour Right for Me? The Vienna Hop-On Hop-Off Bus + Boat is ideal for first-time and repeated visitors to Vienna, and for curious people as well. With a wide range of accompanying benefits, it is also ideal for history buffs, passionate shoppers and gourmands. So, if you like to combine several useful advantages during your holiday, which include getting acquainted with the destination, this bus and boat package is right for you. The Vienna Sightseeing Bus Tours is a provider offering sightseeing services in the capital of Austria. With several lines covering all attractive points of interest, it allows you to get around in an efficient and convenient manner. That way, you will learn to orient in Vienna quickly and see all attractions without spending too much time and effort. Furthermore, bus lines have dozens of stops, so you are free to take off the bus wherever you wish. Discovering the city through sightseeing by bus and listening to audio commentary. You are free to complete the loop or take breaks during the ride unlimited times while the ticket is valid. Several bus lines with more than 50 stations throughout the city. Accompanying audio commentary in 16 languages. Free 1-hour walking tour of Vienna in English and German. Welcoming discounts at participating restaurants and stores. Lower prices for audio guides at certain attractions. Vienna Sightseeing Bus service is a part of the Vienna Pass. Buses of this provider are user friendly to disabled people. You will see the Hofburg, Schonbrunn, Belvedere, Ringstrasse, State Opera and other attractive structures and areas in Vienna. Validity period of 1 or 2 days depending on the selected option. Frequency: between 5 and 30 minutes, depending on the tourist season. Frequency: 20 minutes in high and 40 minutes in low season. Frequency: between 15 minutes and an hour, which depends on the season. Frequency: From 2 to 3 hours, depending on the current season. Stops: Stadtpark, Roman City Carnuntum, Schloss Niederweiden and Schloss Hof. TripAdvisor: According to reviewers on TripAdvisor (around 830) that took part in guided tours of Vienna Sightseeing Tours, this provider deserves the rate of 3. Fully-satisfied customers participate with 20% while the percentage of pleased users is 29%. Overall, the number of customers that have a high opinion of the experience significantly exceeds the number of dissatisfied participants. Lucky we chose this company i noticed they had more buses running around the city other company that had red buses with no roof.Not only do they do city tours but they have tours further out from the centre and use more comfortable buses.All the staff you meet on the street wear yellow jackets.Time tables are on brouchure. Viator: The Viator's reviewers have a more favorable opinion of the Vienna Bus Sightseeing. Around 600 users rated the service with the average rate of 4. 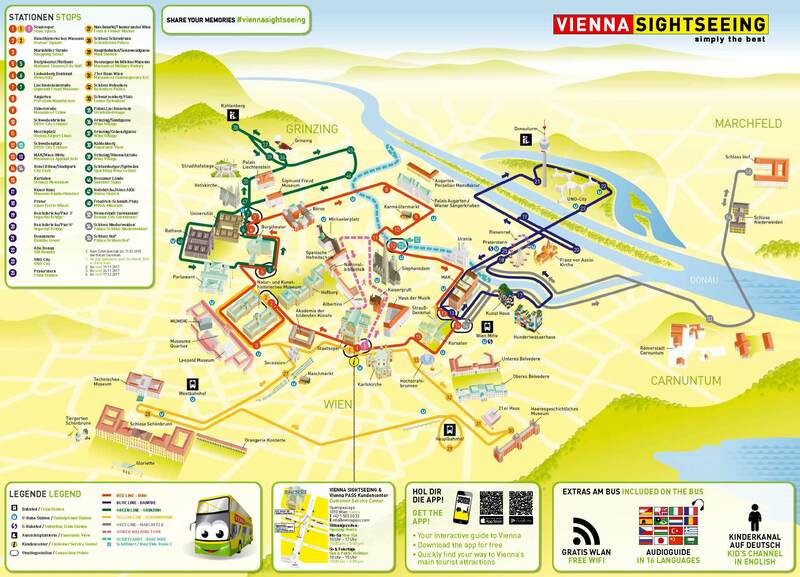 Get Your Guide: As for the Get Your Guide booking website, the former users of the guided tours have an even higher opinion of the Bus Sightseeing Tours of Vienna. Around 250 travelers assessed the service with the 4.4 rate. Vienna Bus Sightseeing Tours offer two major benefits when compared to other providers in the Austrian capital. This service has the lowest ticket prices and most routes. Additional big benefit is the accompanying audio commentary in 16 languages. Also, you are free to make use of Wi-Fi on board without a surcharge. Finally, a complementary walking tour takes you through historic areas of the city off-limits to buses and other vehicles. If you come to Vienna to enjoy the benefits offered by the Vienna Pass, the Vienna Bus Sightseeing comes with the pass for free. Is the Vienna sightseeing bus tours Right for Me? Vienna Sightseeing Bus Tours are ideal for all travelers needing to get around in Vienna efficiently and wishing to discover the city. If the history of the city interests you, book this sightseeing service to benefit of free walking tour of the historical center. Gourmands and passionate shopaholics can count on discounts at some restaurants and stores. Budget travelers can book a 1- or 2-day ticket for the lowest rates. Finally, you can personalize the sightseeing according to your wishes since this provider has the largest number of available bus routes.